Cut beef steak lengthwise in half, then crosswise into 1/4-inch strips. Combine oil, garlic and pepper in large bowl. Add beef; toss to coat. Heat large nonstick skillet over medium-high heat until hot. Add 1/2 beef mixture; stir-fry 2 to 3 minutes or until outside surface of beef is no longer pink. Remove from skillet. Repeat with remaining beef. Season with salt. 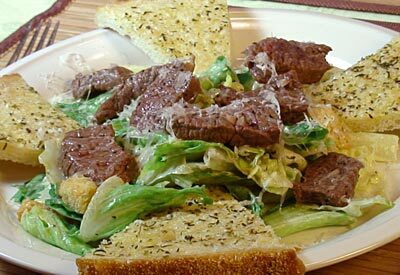 Combine beef with lettuce and dressing from salad mix in large bowl. Sprinkle with croutons from mix and cheese, if desired.